Hello crafty ladies… yet again anther awesome week has flown by and we have the whole weekend ahead of us. Supposedly a huge storm is about to hit my neck of the woods, so the patio furniture is coming in and we are getting ready to hunker down. Sometimes storms can be super cozy, as long as no one is in danger that is. Here’s to hoping that despite or because of the weather in your area, you have a fabulous weekend. Thanks as always for stoping by! This was freaking hilarious. The end is the best part. If you are attending WPPI, make sure to stop by and see some of the Aisle Society gals! How gorgeous was this vow renewal on Every Last Detail… swoon! Have you signed up for our newsletter yet? You’ll love it! I was so amused by this video, and yes, I know I’m a total nerd. LOVE these editable + printable Save the Date invitations from our pal Lia Griffith! PSA. I just found this app called Think Dirty that rates the potentially toxic ingredients in your cosmetics and personal care products. I was SHOCKED to find that many of the products I was buying because of their “natural claims”, where actually incredibly toxic! I’m happy to report that my cupboards are now truly clean! 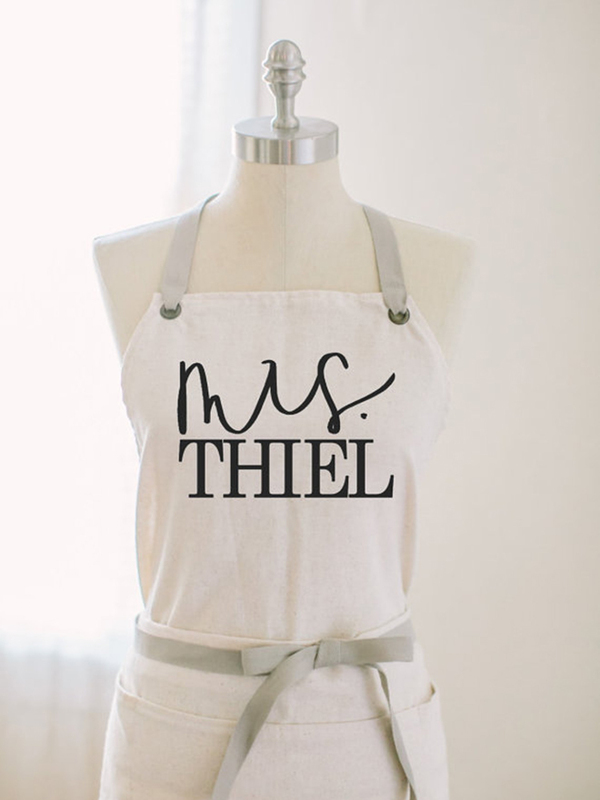 Parris Chic Boutique sells the most darling items on Etsy, including this personalized apron that would make an awesome gift for any newlywed gal who loves to spend time in the kitchen. Definitely check out their shop, you’ll love it!